Niall leads the financial services solution engineering initiatives for Salesforce in EMEA where he works with businesses to transform the way they work by delivering better connections with their customers, partners and employees. Salesforce has been recognised as one of the most innovative companies in the world and through design thinking and other methods Niall helps his customers transform their businesses with technology. 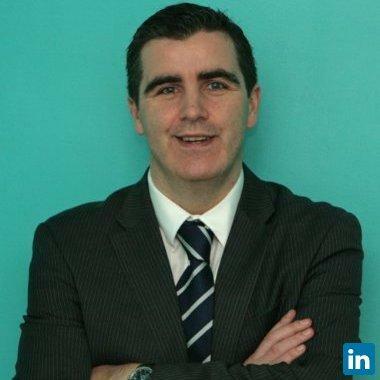 Niall has over 20 years experience in the technology industry initially cutting his teeth in the IT world by setting up an internet service provider (ISP) at UCD where to that point students had no email or internet access. Niall has broad international experience having lived and worked in Dublin, London and Stockholm and participating in customer engagements across the globe. The early part of his career was spent in pure engineering roles designing mission critical software for mobile telecommunications systems at Ericsson. This was followed by a number of years in the London office of software startup Parlano which was spun out from UBS to capitalise on the growing need for realtime collaboration tools in financial services. In this role he was the lead technical resource for the London sales office and quickly learned that flexibility was key doing every imaginable customer facing role from client service, professional services and technical sales. Niall relocated back to Ireland and joined the then small Salesforce operation in Dublin in late 2008 where he quickly established a reputation with his strong customer facing skills and ability to create compelling customer demonstrations and presentations. In addition to individual contribution Niall has brought scale to the business through strategic programs, creating reusable assets, running events and providing training and enablement for his colleagues. Niall leads the development and maintenance of business solutions for the financial services industry based on the Salesforce platform. Niall led the EMEA Community Specialist team working across the EMEA region with customers, internal resources (AEs / SEs / Co-primes) to drive community cloud revenue in the region. Niall quickly built deep product knowledge and developed strong relationships with the senior product leaders for the community cloud team. He participates in regular sales strategy reviews with his international colleagues and PM leaders. An exciting opportunity arose for Niall to leverage his background in financial services when he joined the first vertical team to be created in EMEA. Niall led the development of the financial services business in EMEA creating demo assets, presentations and positioning for Salesforce in Financial Services. Niall also took a leadership role in presenting at financial services events in the UK. CRM pre-sales specialist driving growth in the UK market through customer engagements (deep discovery, workshops, presentations...), presenting at events and developing positioning collateral (reports, videos, presentations) for the EMEA market. Parlano was a Chicago headquartered company and leading vendor of enterprise messaging and collaboration software that was acquired by Microsoft in October 2007. Niall held senior customer-facing roles within the London office consisting of technical pre-sales, implementation, project management, and customer training. During is time with Parlano Niall became a subject matter expert on the financial services and the use of communication and collaboration tools in that industry. Post acquisition Niall worked on the successful integration of the technology into the Microsoft unified communications product range (Lync) and enablement of the sales and consulting practices. As part of this role I presented on persistent group chat (collaboration) at the annual Microsoft TechReady conference in Seattle. Niall started his career in a pure engineering role at the leader in mobile communications infrastructure Ericsson. He led teams building software for mission critical systems, which gave me a great foundation in formal software design processes, and testing (waterfall, agile, capability maturity models etc.). Key projects included – Pre-GPS solutions for mobile positioning, Industrialization of adaptive antenna systems and client server software development for the management of mobile network infrastructure (OSS). Niall spent a year living and working in Stockholm at Ericsson HQ as part of his role. Advanced Software Engineering - Client-Server systems, computer and machine vision, image processing and telecommunications engineering. Project : Dynamic document generation in client-server web applications. Primary degree in Engineering included studies in Mathematics, Electronic, Electrical and Computer Engineering, Telecommunications, Biomedical Engineering and Business. Research project on simulation of nonlinear systems in biomedical engineering.